Any reader of Going Coastal knows that I’m drawn equally to Star Wars and the world of Lego bricks. So, I was thrilled to see the current display at Santa Cruz’s Downtown Library. (The not-so-mini Lego figures are the handiwork of Steven Mead, who reimagines Lego minifigures using Lego bricks in a 20-inch scale.) 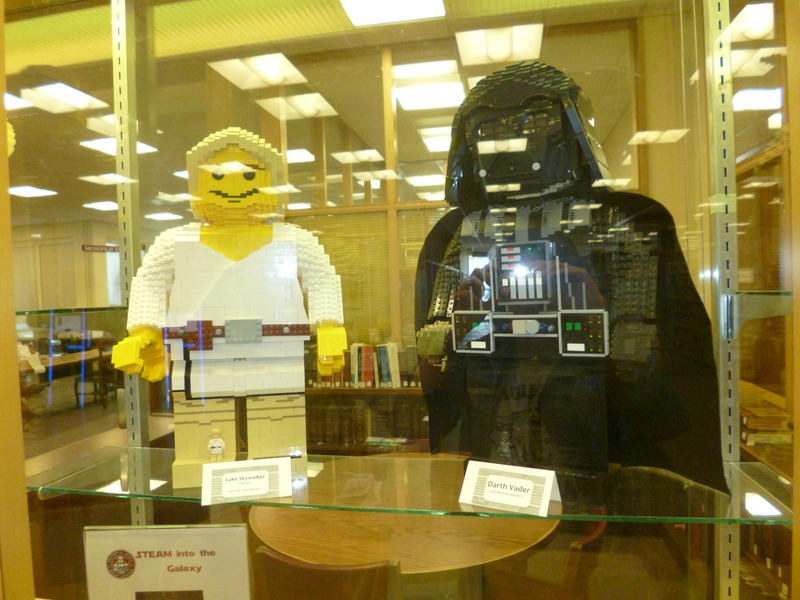 The exhibition is part of the library’s Star Wars Day celebration, which takes place from 2 to 5 p.m. on May 4th at the Downtown Library and Atlantis Fantasyworld in Santa Cruz. It’s called “STEAM Into The Galaxy,” referring to the Science, Technology, Engineering, Arts, and Math curriculum activities that will take place. If you’ve watched the Star Wars episode of The Muppet Show enough times to know it by heart, and need another way to celebrate Star Wars Day in Santa Cruz County, why not stop by? The Downtown Library is located at 224 Church Street in Santa Cruz, while Atlantis Fantasyworld is at nearby 1020 Cedar Street.